Here is a link to how this section used to appear! Selling Synthesis by the Pound/Sound/Bank/Hour. I have created patches and banks for Arturia, Creamware, Emu/Ensoniq, Modal, PPG, Studiologic, Steinberg, Yamaha and numerous companies and devices, some sadly gone. Modern styling of vintage models and vintage soundscapes on new technology considered. I also created a 32 patch Ensoniq VFX cartridge, working with Keith Emerson (RIP) which got released via Voice Crystal. 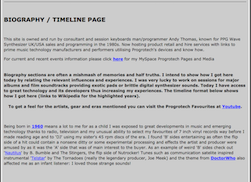 Copyright © 2019: Andy Thomas - Progrotech. All rights reserved. Website by Webtree Limited.